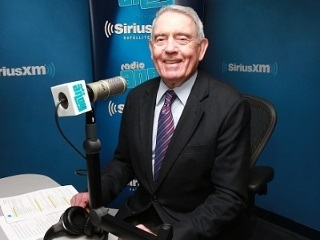 Dan Rather's America debuts Tuesday on SiriusXM. How’s this for rock-solid timing? Dan Rather’s brand new weekly SiriusXM program, Dan Rather’s America, will debut the day after Monday’s Presidential debate. Live from Rockefeller Center in New York. While 88-year-old Vin Scully was honored with a special pre-game ceremony Friday night at Dodger Stadium ahead of his Oct. 2 retirement, Rather, who will turn 85 Oct. 31, shows no signs of slowing down. The program will air on Radio Andy (Channel 102). Cohen’s Radio Andy channel includes shows that cross the spectrum from news to pop culture, with a stable of hosts ranging from Andy himself, to Sandra Bernhard, Bevy Smith, John Benjamin Hickey, Jason Biggs and Jenny Mollen, Jonathan Alter and more. In July, Rather covered the DNC and RNC for Radio Andy. The one-hour weekly show will feature a mix of commentary, special guests and calls from listeners.